Yes here’s a new part of this site. Artist of the week. Every Friday, we will show you KPOP and JPOP artist. So that you can get to know them better. This week’s artist of the week is none other than F(x). F(x) is a group under SM Entertainment. The same agency with famous groups such as SNSD and Super Junior. 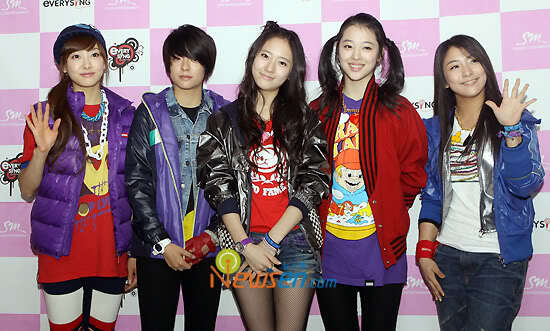 From the picture above, the members are the following: (from left to right) Victoria, Amber, Krystal, Sulli, and Luna. They debuted last year with the single LA Cha ta which was released digitally. To anticipate the debut of the group. SM released teaser for 5 days for each member until the debut of the group. A month later. F(x) released the EP Chu~♡ which consists of 3 songs. The group grew even popular with the release of Chu~ which shows more of the cute side of the group. After 6 months of hiatus. The group returned with yet another EP. NU ABO was released on May 4th of this year. The mini album topped online charts such as Monkey3, Dosirak, and Bugs. With the success of their new mini album, the group proved their dominance with other artist. F(x) is currently preparing for their new single/album. The members are doing their solo activities and member Amber is on break from an ankle injury a few months back. The 5 ladies of F(x) returns to Music Core this week with their follow up track Mr. Boogie. Performing without Amber because of her ankle injury. F(x) took the stage again in a brand new concept similar to Kara and SNSD. The song has been a favorite by fans since it’s release and the girls are giving it to them. Even though the performed without Amber, the performance is still an awesome one without a doubt. F(x)’s ID for MYX Philippines! f(x) greeting to Filipino fans! After a greeting by their fellow SM Entertainment group SNSD to the Filipino fans. F(x) has also made another one for us. I know it’s not much. It’s more of f(x) promoting their mini album Nu ABO to the Philippines. But hey, this may be a hint of a coming tour here or something.